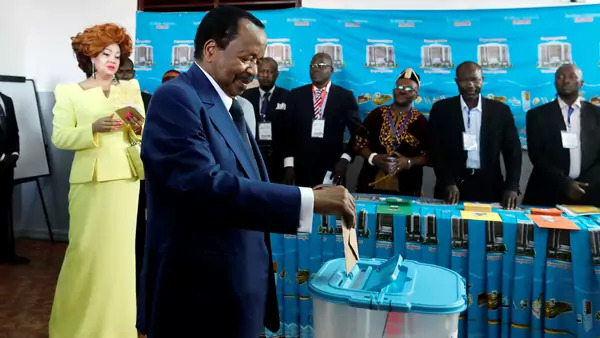 As Cameroon-watchers await the official results of this month’s elections amid court challenges, the outcome is highly predictable—victories for the ruling Cameroon People’s Democratic Movement (CPDM) and for the long-serving incumbent president, eighty-five-year-old Paul Biya. But the country’s future is utterly uncertain. It is as though Cameroon’s story is diverging in two radically different directions: one in which past is prologue and citizens and external partners find comfort in familiar faces and continuity; and another in which security is elusive, disintegration persists, and Cameroon becomes unrecognizable to those who knew it before. The October 7 elections were held against a backdrop of increasing instability as the state battles both Boko Haram in the north and Anglophone separatists in the west. Alarmed by reports of horrific extrajudicial killings, and by the displacement of roughly a quarter of a million people, some of Cameroon’s external partners, including the United States, are grappling with tough questions about the wisdom of ongoing security assistance and cooperation. In some areas, voters were too worried about their immediate security to go to the polls. Others have lost faith in the legitimacy of the exercise, and some of the government’s choices, like its embrace of international observers of dubious credibility, suggest there is indeed reason to doubt the integrity of the process. Those who value a stable partner in Cameroon over the long run should be interested in supporting a third possibility beyond an unsustainable status quo and a descent into chaos—one in which reforms create a more inclusive society, generational change refreshes the ranks of leadership, those responsible for abuse are held accountable for their crimes, and the connective tissue between government and citizens is strengthened by far more than pro forma electoral exercises. Right now, this third path is far more fantasy than reality. It will take a recognition that these election results settle none of Cameroon’s outstanding questions, and strong internal and external support for real political dialogue, to create space for a better future.